I've never been much of a honey fan (probably because I don't really like tea...), but I absolutely love the color of it! Mix that with the beautiful blue night skies of summer and you have the recipe for an absolutely beautiful wedding. I tried to stick with the fun and playfulness of a golden yellow, but glam it up a bit with spicy browns and a sky full of dark navys and indigos. Enjoy! 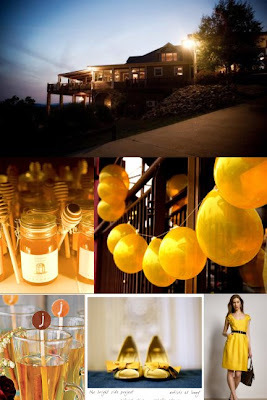 row 2: honey favors via fete, golden balloons via please let me know!